The Le Vian name has been associated with the world's finest jewellery since the 15th century. 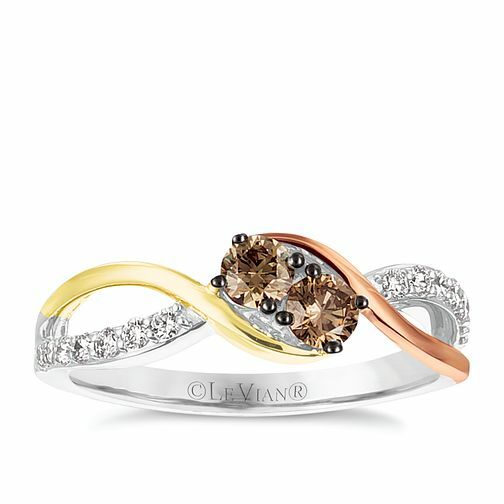 This stunning ring comes in twisted 14ct Vanillia, Strawberry and Honey Gold with a divine Chocolate Diamond centrepiece. Vanillia diamond shoulders add a luxurious combination. Le Vian 14ct Vanilla Strawberry & Honey Gold Diamond Ring is rated 5.0 out of 5 by 1. Rated 5 out of 5 by Anonymous from Absolutely stunning ring ! This ring is stunning, the photo doesn’t do it justice, I’ve had so many compliments when I wear it as the chocolate diamonds are so sparkly. I wear it with my other strawberry gold and chocolate vanilla ring. So pleased I bought it in the sale.